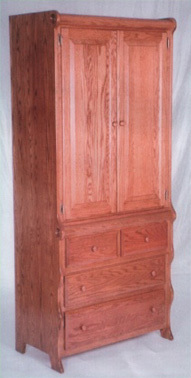 Come on, let’s face it - wouldn’t this beautiful armoire, built by the Amish of solid oak, look great in your bedroom? Of course it would, and it’s made in the same sleigh style, and to the same depth as the rest of our sleigh style bedroom collection. Four roomy drawers, two large and two small, along with two doors on top that conceal two adjustable shelves, and a generous 78.5” height allow for plenty of storage. If you’re going to go with the sleigh theme in your bedroom you just have to have one! Add one of our raised panel sleigh beds, a couple of night stands, and a dresser or chest of drawers, and you have the makings of a great bedroom. Why not start your collection today? What? Need cherry? No problem, we can get it for you in solid cherry too!